All transactions are safe and secure with a reliable history in online purchasing behind each of our associates. 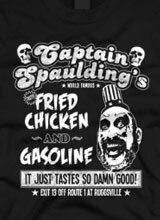 Buy the Captain Spaulding's Fried Chicken Shirts to own Captain Spaulding clothing and merchandise. Which team are you playing for? If you are in the presence of Otis Driftwood, Baby Firefly, their gigantic brother Tiny and the rest of the psychopathic gang, then you better put on a Devil’s Rejects t-shirt like this one featuring Captain Spaulding's Fried Chicken and Gasoline. If you can’t beat them, which you can’t, then join them. It is the only true means of survival. Just agree that, "It just tastes so damn good!" Stop by and see 'em! Exit 13 off Route 1 at Ruggsville! In addition to the Captain Spaulding's Fried Chicken Shirts above, browse the Captain Spaulding Clothing Gallery for more apparel like men's and women's clothes, kids shirts or hoodies.